One of my absolute favorite things is the world is the Harry Potter series. Every time I read the books or see the movies, it amazes me. Harry’s world and the magic of Hogwarts captivate me. I feel like I’m there and something amazing is about to happen. 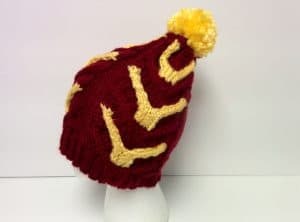 I wanted to bring some of that magic and mischief into my world, so I created The Marauder Beanie. When I set out to make this beanie, there were a few things I wanted to incorporate into it. First of all, there had to be cables. Cables add something elegant and cool to any piece, and since it’s Fall, cables are a big deal. I love the look of them and it’s so nice seeing them around, so I wanted to incorporate them into the design. Secondly, I wanted to do something with the marauder’s map. The map was so important and it was one of Harry’s few connections to his father, and I wanted to work that in somehow. 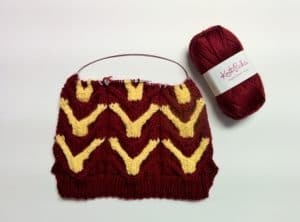 For the Gryffindor House colors, I chose Knit Picks The Mighty Stitch yarn in Bulky and used the colors Pomegranate and Canary. I decided on panels of cables that repeated around the hat three times, for Prongs, Padfoot, and Moony (Wormtail didn’t deserve it :p ). 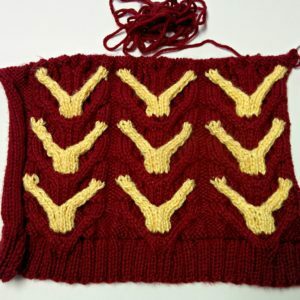 And for the actual cables, I wanted them to look like Prongs’s, or James’s, antlers. Work in cables. As long as you can do basic cables, this pattern will be doable. It’s not super fancy but it looks like more goes into it than it does! Stranded (fair isle) knitting. I did the color changes for the cables by carrying the yarn back and forth behind the piece, then weaving in the ends. Stranded knitting isn’t hard, but it helps if you’ve tried it before and are familiar with it. The beanie is worked flat and seamed close at the end, so you don’t need to know how to work in the round. 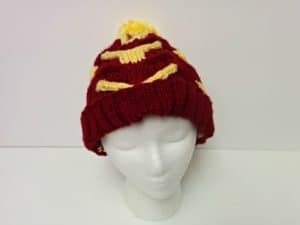 Get the pattern for this Harry Potter beanie over on Ravelry! 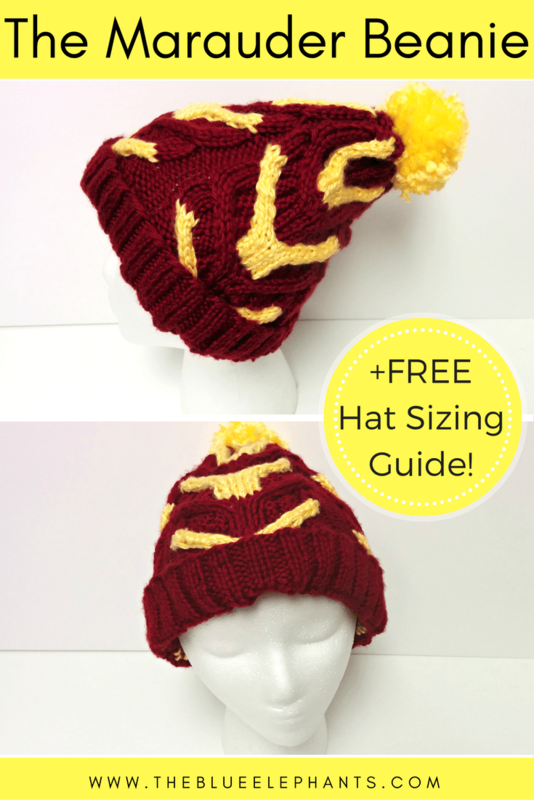 So if you don’t want the pattern for The Marauder (it’s cool, I still like you), you can still get the free hat sizing guide I promised at the beginning of this post. 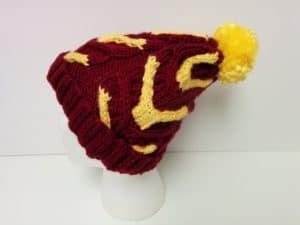 I’ve been making hats for a while and for me, the hardest thing was getting the hat to be the right size. I looked up tons of sizing charts and guides; I read everything on how to get the right fit, but it didn’t always help. And it is beyond frustrating to make a hat and not have it fit. Imagine if you were to make a bunch of hats as gifts. You spend so much time making them, designing them and perfecting these hats… only to find out it’s far too small. Or too big. Well, I don’t need to imagine this 🙁 I did it time and time again, and the only size I could get right was for my own head. So, fast-forward to when I actually started taking my knitting/crocheting more seriously. 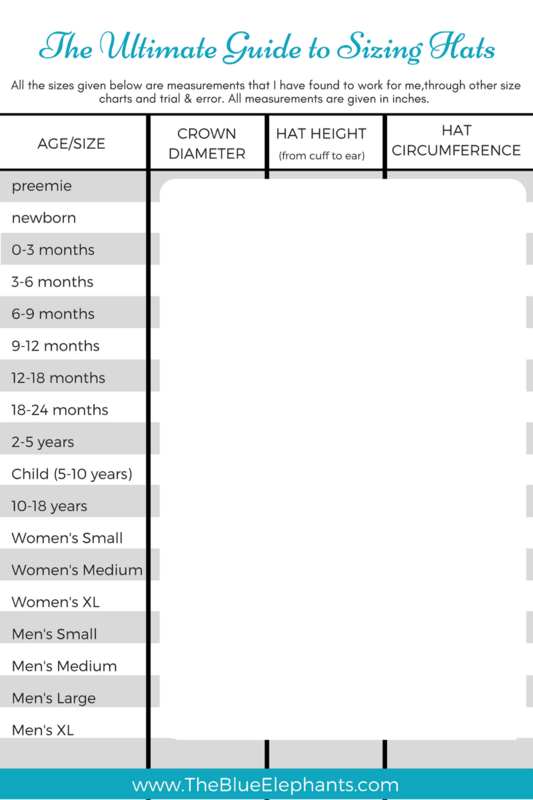 I decided to create a foolproof sizing chart I could count on. I tracked all the sizes I used, what worked, pulling from other guides and making sure I was getting “standard sizes” right. And I’ve compiled all of those sizes into a free printable for all you lovely folks. 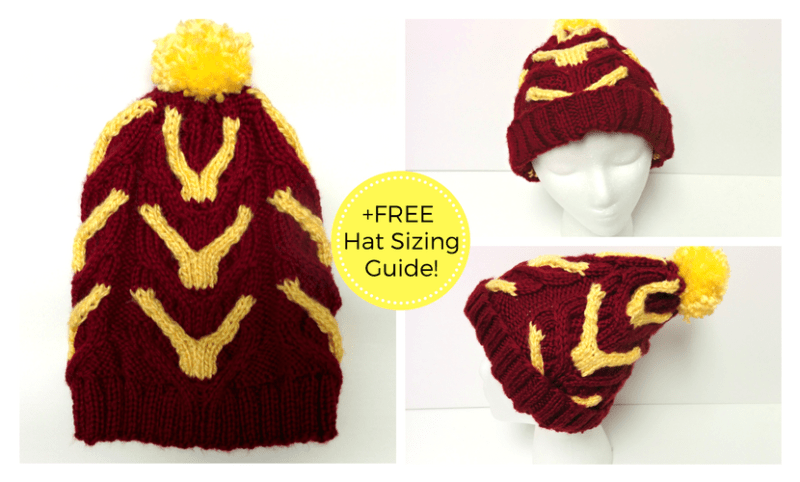 To get the Ultimate Hat Sizing Guide, fill out the box below and you’ll get access to the resource library where you can download the guide, along with all the other subscriber-only freebies! I know some people who would love this! Thank you for sharing at Merry Monday! I need to keep this hat in mind for next Halloween! It’s so neat! Thanks, Bibi! You could still make it in time for this Halloween!